NEW YORK – The heart-stopping whoosh of a roller coaster on its downward trajectory, the sugary smell of cotton candy and salt water taffy, the sideshow barker’s incessant chant to “step right up and see the strangest sights on earth.” All played their roles in creating indelible memories for the millions of people who visited Coney Island over the last century. Edward J. Kelty (American, 1888–1967) panoramic photo of Ringling Bros. Barnum & Bailey ‘Congress of Freaks.’ Ross Art Group image. While the golden era of New York’s most beloved amusement park has come and gone, relics of Coney Island’s colorful history and photos of its amazing cast of performers move back into the spotlight in “Sideshow,” an exhibition running May 2-25 at The Ross Art Group’s Manhattan gallery. Sideshow’s featured collection belongs to Dr. Robert M. Lerch, a New York City physician and longtime collector of the bizarre and unusual. The exhibition chronicles roughly the first 50 years of Coney Island – whose first enclosed amusement park area opened in 1895 – with additional pieces from other early 20th-century carnivals and circuses. The “backbone” of the show, said Ross Art Group’s owner, Mickey Ross, is the collection of 28 original architectural drawings and blueprints that conceptualized Coney Island carnival rides and structures. “The drawings were created by amusement park ride inventor and manufacturer William F. Mangels (German/American, 1867-1958) and depict such classic rides as the ‘Whip,’ Loop roller coaster, and carousel horses with a mechanical function,” Ross said. Like all other items in the exhibition, the architectural designs will be available for purchase. “Kelty had a fascination for human oddities and spent 20 years following and photographing circus troupes. Once a year, the entire Ringling Brothers ‘Freak Show’ cast would gather for a group shot. It was a big event,” said Ross. 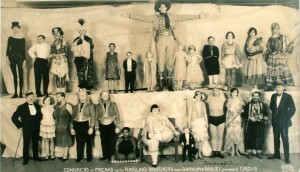 “The pictures include every imaginable type of performer – sword swallowers, snake charmers, bearded ladies, fire eaters, and ‘giants and midgets,’ plus aerialists and clowns.” Kelty’s Congress of Freaks photos, which originally were sold to the performers themselves as mementos, are highly sought after by today’s collectors. Other iconic photos featured in Sideshow were taken prior to the end of World War I by Arthur S. Mole & John D. Thomas. 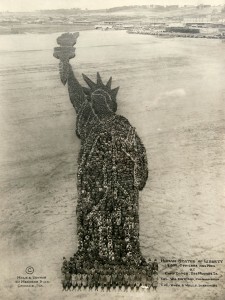 Their technique consisted of mustering thousands of people to form aerial views of iconic symbols, such as The Statue of Liberty or Uncle Sam. Most of the photos’ participants were army troops who took part with the US Government’s permission. Robert Lerch’s fascination for Coney Island memorabilia, arcade machines and quirky figural folk art dates back to his 1960s childhood in New York City, when he was introduced to the vast archive of pioneer collector, author and historian Frederick Fried. Mole & Thomas ‘Human Statue of Liberty’ photograph formed by 18,000 officers and enlisted men at Camp Dodge, Des Moines, Iowa. Ross Art Group image. In fact, the Fried collection not only inspired Lerch to set off on a 40-year quest for the offbeat, it also eventually ended up, in part, in his own personal collection. “When Mr. Fried died, his daughter inherited his collection. I later acquired a portion of his Coney Island archive, which was considered the ultimate of its type, through a person who knew his daughter,” Lerch explained. Sideshow – Exhibition and Sale featuring the collection of Dr. Robert M. Lerch (email manmoon6@aol.com) with other select additions will be held May 2-25 at the Ross Art Group’s gallery, 532 Madison Ave., 4th Floor (entry on 54th Street), New York, NY 10022. 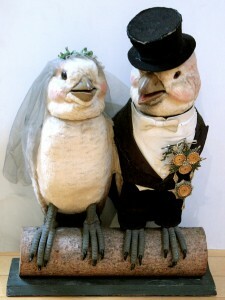 Animated, electric-powered store window display of birds in bridal attire. Ross Art Group image. special added attraction, several performers from Coney Island USA’s Sideshows by the Seashore will be there at the gallery to entertain, pose for pictures and help raise awareness that Coney Island is back in business following the devastation of Hurricane Sandy. Dr. Robert Lerch has pledged to donate the sale proceeds from one of his rare Coney Island photographs to the nonprofit Coney Island Museum. For additional information call 212-223-1525 or email sales@rossartgroup.com. Online: www.rossartgroup.com. The Ross Art Group was founded 18 years ago by veteran textiles businessman Mickey Ross. His background in the design and creation of printed fabrics inspired Ross to collect vintage posters while traveling throughout Europe. What began as a hobby evolved over time into a thriving retail art gallery. The Ross Art Group’s current inventory of 2,500+ posters may be viewed in its entirety by visiting its full-service gallery at 532 Madison Ave., New York, N.Y. (private appointments also available), or via a searchable, fully illustrated online database at www.rossartgroup.com.